For me, researching a topic often pulls me in so many interesting directions that it can be difficult to refocus on the details that really matter. I don’t want to get lost in the milieu of research, rather I need just enough information and details to enrich my story to keep it exciting, or to convince readers that my details and characters are authentic, or to keep my plot line progressing at the proper pace. Building stories and the world that one’s characters live in is a fun challenge whether it takes place on Earth or on some made-up planet or anywhere else for that matter. Today the internet is the go-to place to search for anything imaginable. It’s a magical place that can entice a person to explore forever and not stop when you’ve found what you were looking for because “everything” is interesting. This can be fun, but not always. It can be a time sucker and prevent real progress, and one can get lost in places never intended to go to in the first place, like Hansel and Gretel. Focusing on the task in hand can seem almost impossible. Last Friday my friend Joanne and I were running around Burnaby Lake. 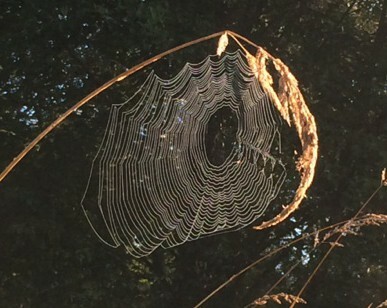 The sun had caught this spider web, bringing into focus what is often nearly invisible, and we couldn’t help but stop and admire it. Call me crazy, but it made me think of story building and how this spider had to both start and finish somewhere. Not only that, but the purpose of the web itself is to catch food for survival. Now unless you as a writer have given up your day job and risked everything in order to make a living at writing, the purpose of your story as a writer isn’t literally for survival. We write because we love to tell stories and build our story worlds and have them make a difference in our reader’s lives, whether for sheer entertainment or for teachable moments when we view our worlds in unique ways. Research can provide our stories with anything from the foundation up, but it must all be built from the author’s story ideas and knowledge of this craft called writing. I’m sure spiders learn along the way too and build better webs with practice. I read this great blog post about research by Tosca Lee on the blog The Kill Zone. Check it out as I feel her method not only makes sense, it is also a good use of one’s time and energy. Now that’s worth researching. This entry was posted in Research and tagged research, writer's journey by Karalee Greer. Bookmark the permalink. Karalee, you’re so right about getting lost in research — happens to me often. On the good side, this natural curiosity is what drives writers forward into the unknown, so it’s an asset to be cultivated. When I wander far afield from my original research mission, I try to be mindful of whether I’m really learning something useful, or just using research as my cover story for procrastination.